MINIMAL WEAR, DETAILS ARE BEAUTIFUL, STILL SOME OF THE ORIGINAL SILVER FINISH OVER THE BRASS IN SOME POTS, NO DEFECTS, LOOKS LIKE YOU CAN MAKE OUT A NUMBER 17 UNDER A LOOP WHERE THE SERIAL NUMBER WAS ORIGINALLY STAMPED, DIRECT FROM THE FAMILY WHO HAVE HAD THIS PASSED THROUGH THEIR FAMILY IN THE SAME HOME SINCE THE MID 1800'S IN MA. 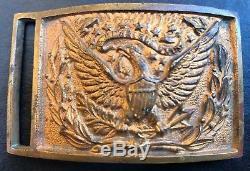 The item "Very Rare 1851 Civil War Union Officer Eagle Belt Buckle All Original" is in sale since Sunday, November 4, 2018. This item is in the category "Collectibles\Militaria\Civil War (1861-65)\Original Period Items\Belts & Belt Buckles". 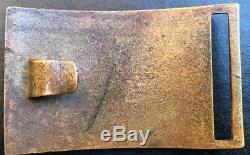 The seller is "lindaveto88" and is located in Stoneham, Massachusetts.